Unique roll-up pockets help keep ends off the ground. Comes in 5 beautiful colors. I have always wanted a stretchy wrap with my newborns, so when baby #3 was on the way I knew I had to finally get one. Thankfully LÍLLÉbaby just came out with their Tie the Knot wrap, and we were able to try it out with my brand new little boy. Living in Arizona makes the warmth that comes with babywearing even more of a concern, and I always heard that stretchy wraps were especially hot to wear, so I was a little worried. With the LÍLLÉbaby Tie the Knot that is not a problem. The buttery soft Tencel fabric is extremely lightweight and breathable. Even with our extra hot June weather it was quite cool to wear. The Tie the Knot is a long stretchy wrap, which allows it to fit almost every shape and size of wearer. It is comfortable, supportive, and lets you get plenty of sweet squishy snuggles. The LÍLLÉbaby Tie the Knot has some unique features that I especially love. Roll up pockets: these allow you to roll up the ends and secure them with the elastic bands to prevent the tails from dragging on the dirty ground while you put on the wrap. Neck support pocket: the large pocket not only provides a place to put the necessities (binky, burp rag, diaper, etc.) but it also allows you to add more neck support with a small rolled cloth. 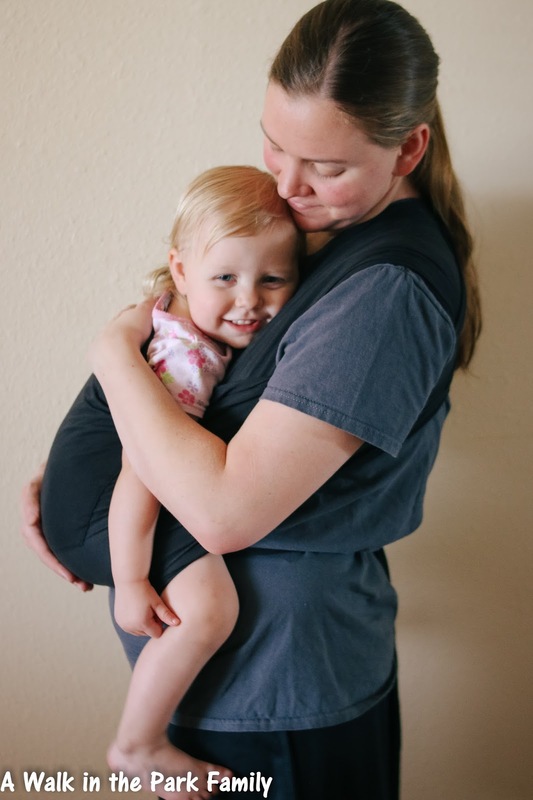 Because the Tie the Knot is a little less stretchy than other wraps, it is more supportive for heavier babies. With a generous weight limit of 31 pounds, I can even wear my 25 pounds two year old in it (although it is best and most comfortable for smaller babies during the first year). 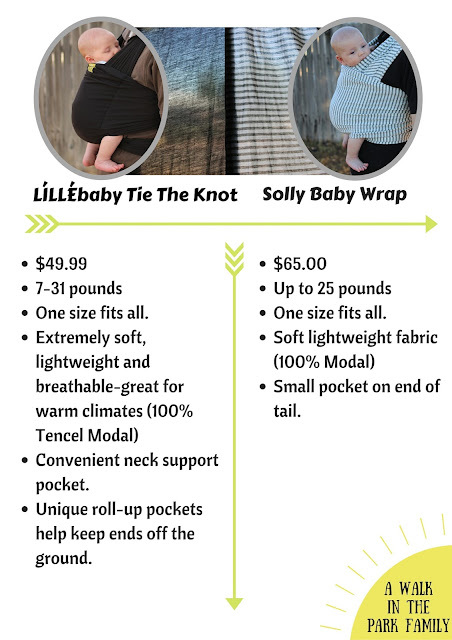 Overall the LÍLLÉbaby Tie the Knot is an amazing, comfortable, soft, breathable wrap. I love it and would highly recommend it for anyone looking for a stretchy wrap. The Tie the Knot is similar to the Solly Baby Wrap, so I figured there would be some questions about that. Although the fabric is similar, the LÍLLÉbaby Tie the Knot is slightly softer and definitely thinner and more breathable. This makes the Tie the Knot the better choice for warmer climates. 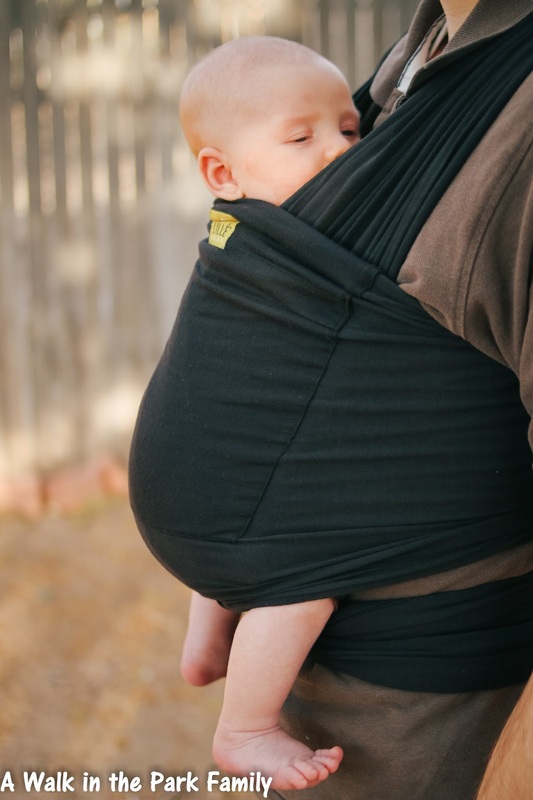 The LÍLLÉbaby Tie the Knot also has a larger, more convenient pocket than the Solly, and features the roll up pockets to keep the tails from dragging. If you are like me and like saving money, the Tie the Knot is also less expensive than the Solly ($49.99 vs $65).